2017– a year when 464 people lost their lives or were seriously injured on North Yorkshire’s roads. While that number is reducing – down from 504 in 2015 and from more than 1,600 in 1990/1, Julia is determined to ensure it continues fall. North Yorkshire has one of the highest accident rates in the country and in 2015, 44 people died on our roads. There is proven evidence that nine of those deaths were the result of speeding. However, speed was a probable factor in many more of the deaths and serious injuries that took place. While speeding is dangerous, it can harm our communities in other ways too – with many people reporting that their neighbourhoods are blighted by the noise and intrusion of speeding traffic. Little wonder, therefore, that residents say road safety is such a big issue and want more to be done. First annual report about the use of safety camera vehicles published. … and give the facts that might change your opinion of them. 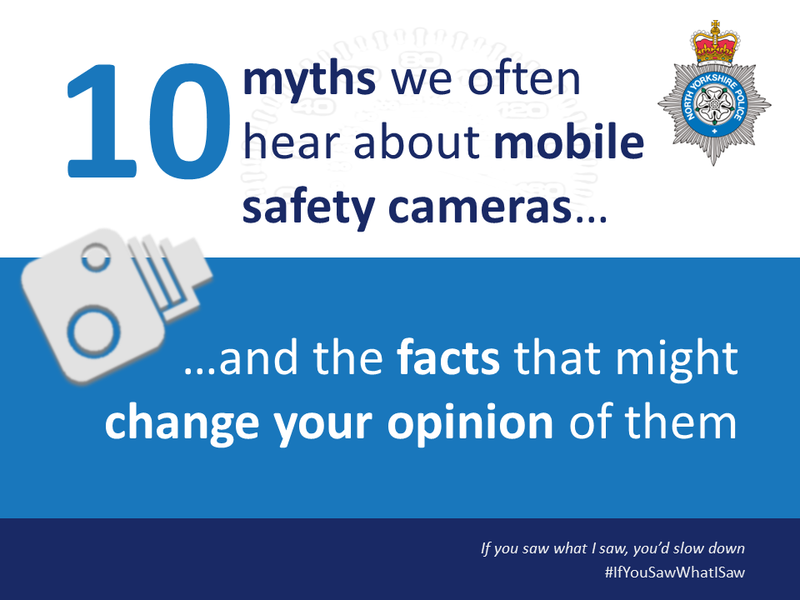 North Yorkshire Police has revealed the truth behind ten common myths about mobile safety cameras in a bid to highlight why they are used. They include the true effectiveness of camera vans at reducing casualties, why certain locations are chosen over others and whether enforcement cameras are a “money-maker” for the force. North Yorkshire Police is sharing the facts as part of its year-round campaign to make North Yorkshire’s roads safer. Called “If you saw what I saw…” the campaign uses the first-hand experiences of officers who deal with fatal crashes to urge motorists to drive more carefully. The report examines what happened during 2017– a year when 464 people lost their lives or were seriously injured on North Yorkshire’s roads. While that number is reducing – down from 504 in 2015 and from more than 1,600 in 1990/1, Julia is determined to ensure it continues fall. Number of safety camera vans: Six vans at start of 2017, increased gradually throughout the year to twelve by December 2017, plus one motorcycle. Purpose: To contribute to improving road safety, casualty reduction and antisocial road use by monitoring traffic for speed offences, using a mobile phone whilst driving, failing to wear a seatbelt, dangerous driving plus many other offences. Use: Monitored 448 different sites over more than 13,885 hours. Impact: Processed 80,582 road safety violations – the equivalent of 5.8 for every hour they were in operation. Education: Of those violations, 43,053 led to motorists attending a speed awareness course. District with the highest number of violations: Hambleton, with 17,706. District with the fewest violations: Scarborough, with 3,689. Site with the most violations: A64 Westbound Whitwell Hill, with 4,686. Site visited most frequently: A19 Shipton in Beningbrough, with 178 visits during the year. District with the most violations per site: Hambleton with an average 243 violations per site. Roads Minister Jesse Norman has announced a new two-year action plan will be developed to address four priority groups, including rural road users. The extent of concern about the issue in North Yorkshire is illustrated by a survey for the Police and Crime Commissioner which found found eight in ten people were concerned about road safety in the county, while more than half believed police should use more safety camera vans. 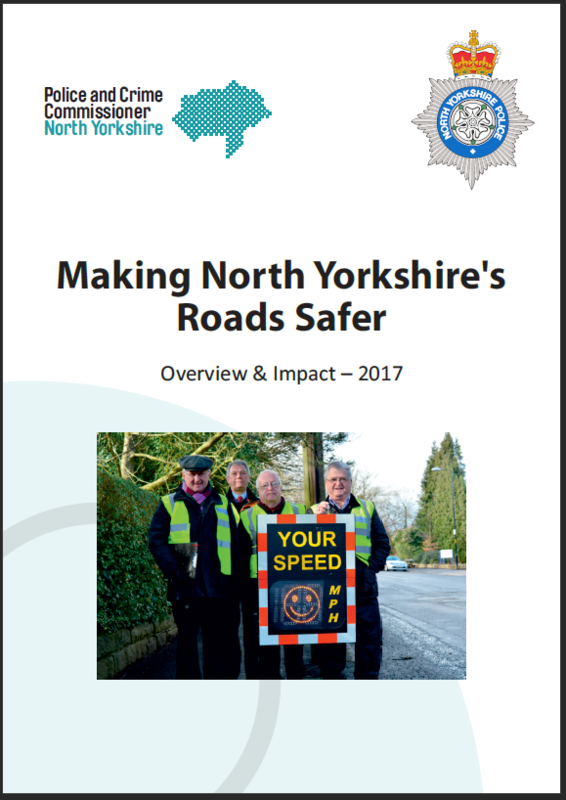 Road Safety continues to be a key concern for the public of North Yorkshire, with road safety and roads policing featuring high amongst public priorities during consultation for the Police and Crime Plan 2017-2021. 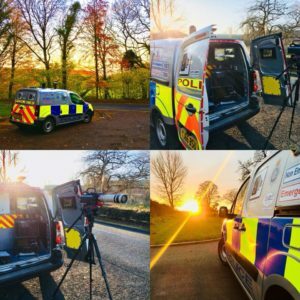 On the 8th December 2017, one of the Safety Camera Officers was deployed around Catterick and Bedale in one of the small externally deployed vans. 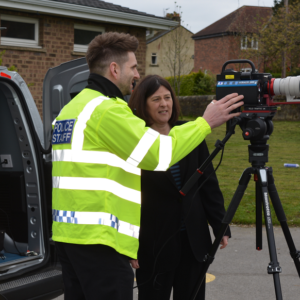 Find out more about the day in the life of a safety camera van by reading this update from the North Yorkshire Police Traffic Bureau. The new, more agile vehicles will bring the total number of safety vans in North Yorkshire up to 12. Due to their smaller size the new vans are more suited to hard-to-reach locations. Using state-of-the art camera equipment, the vans can not only detect speeding drivers, but can also identify anti-social driving such as seat belt offences and drivers using mobile phones behind the wheel. The vans are also equipped with Automatic Number Plate Recognition technology (ANPR), which assists with the detection of cross border crime, protecting those communities more vulnerable due to their location, by deterring and disrupting travelling criminals. Over the past three years Newcastle University have conducted studies into North Yorkshire’s KSI (killed or seriously injured) statistics across 22 local sites and evaluated the effect of the safety camera vans on the level of road safety. The study found that due to the deployment of the vans to those 22 sites reviewed there has been a reduction of eight casualties. The Commissioner is asked to approve an expansion in the number of safety camera vehicles to be based and operate primarily in rural areas. Following the decision to embed Community Speed Watch as a permanent part of the North Yorkshire Police roads policing strategy and offer the scheme across the region, the village of Pannal has already seen some very positive results on the number of speeding vehicles in their area. 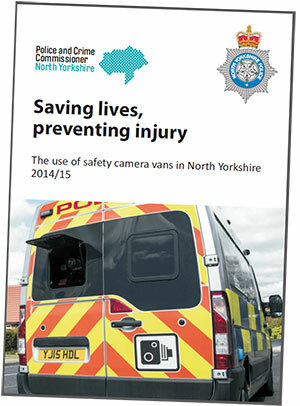 This report, Saving lives, preventing injury explains how safety camera vans were used in North Yorkshire in 2014/15 and what contribution they made to enforcing the laws of the road and reducing speed-related death and serious injury. 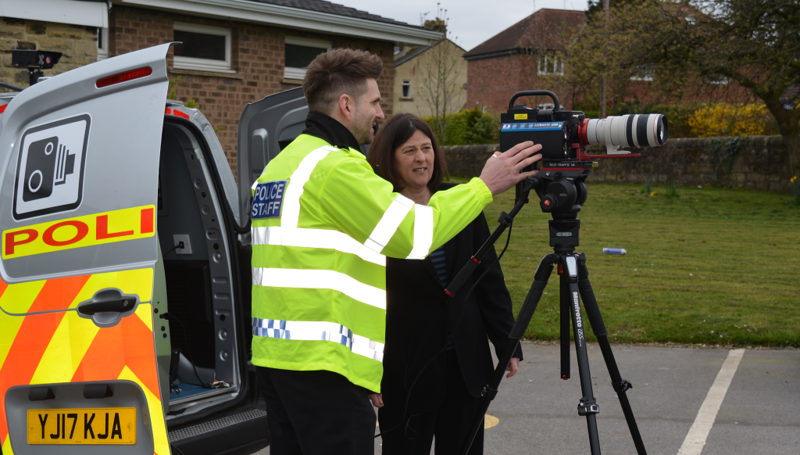 In order to increase safety on North Yorkshire’s roads and to help tackle rural crime, Police and Crime Commissioner Julia Mulligan, has today (24 March 2016) announced an increase in safety camera vehicles, which will be located at different rural bases around the county. Very much led by local people in their communities, the scheme will help educate drivers about their behaviour, especially the impact it has in villages and other communities where it is seen to be a problem. The launch follows a successful pilot last year, which proved hugely popular with parish councils, as well as residents wanting support. 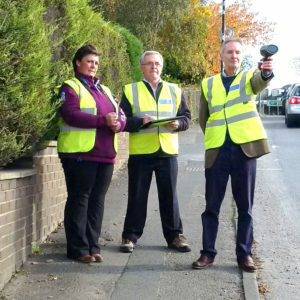 Under the scheme, North Yorkshire Police will train up volunteers, who using specially purchased equipment, will measure the speed of vehicles travelling through their community. If the driver is speeding they will receive a notice from the police warning them about their driving and the impact of speeding. The York branch of IAM is run by a group of more than 30 volunteers who are each dedicated to helping motorists improve their driving skills. Any approach to just generate money is frankly misguided. Safety, and specifically reducing the number of people killed or injured on our roads, has to be the focus. Vans in North Yorkshire will never be placed anywhere just to raise money. A Safety Camera Van Annual Report will be released before the end of the year which will be fully transparent about the Vans activities, money they raise and what it is spent on. 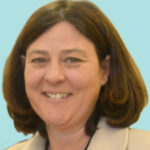 Speeding vehicles are an all too common theme at Julia’s surgeries, and in the past the public have felt frustrated that they are unable to influence driver behaviour within their own communities. Last year Julia commissioned a road safety survey and the results showed that four out of five residents were concerned about road safety in North Yorkshire, and that 72 percent of people felt that more should be done to improve road safety through enforcement or education. 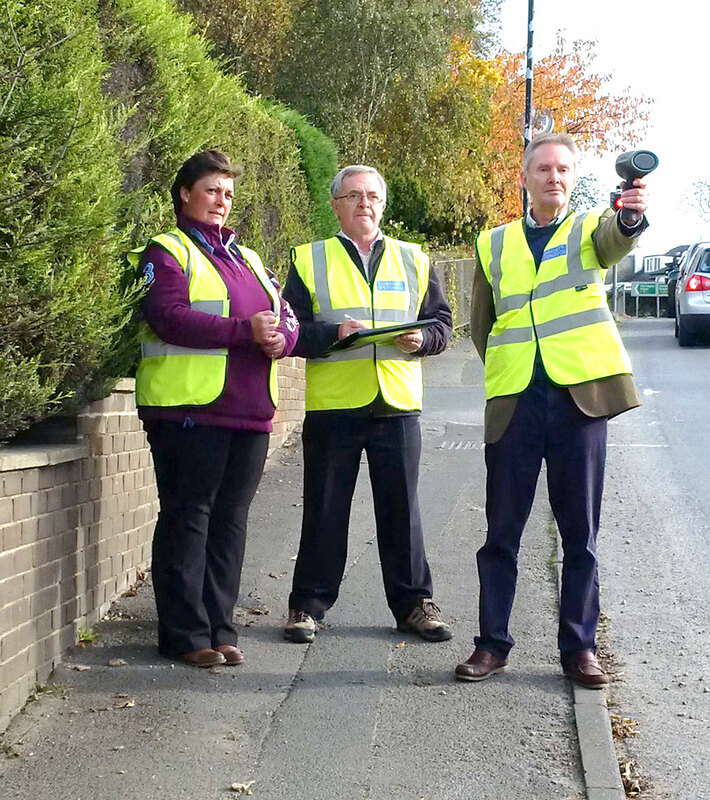 The Community Speed Watch pilot programme will run at up to 50 sites across York, Harrogate, Selby and Hambleton where local people have already registered a concern about speeding vehicles. The sites are mainly residential areas with 30 and 40 mph speed limits. At present, a quarter of all detected crimes in North Yorkshire are perpetrated by cross-border criminals, who take advantage of the region’s large geography and road network to prey on local communities. As well as theft and rural crimes, cross-border criminals can be involved in a wide range of other offences, including child sexual exploitation. Automatic Number Plate Recognition (ANPR) is already used by many forces (including North Yorkshire) to identify criminals en route, and build intelligence on their movement patterns. However, the new investment will allow North Yorkshire Police to increase its coverage across the region, refine its intelligence team, and deploy officers proactively to disrupt criminals in their vehicles. Together with the Chief Constable, I am absolutely committed to improving road safety in our region, and I hope that the activities we have announced today will make a significant contribution to reducing fatalities, injuries and anti-social behaviour on our roads. The recent survey I undertook showed without question the vast majority of the public are concerned about road safety, and this shows we are taking those concerns seriously. By approving the proposals we have increased North Yorkshire Police’s capacity for enforcement to bring it into line with that of other comparable Forces, but I would also like to call upon the region’s drivers, bikers and cyclists to play their part, and help us to keep the roads safe for everyone. The survey shows loud and clear that residents want more done about road safety, and the fact that we have had several very serious traffic accidents in the area in just the past 10 days underlines the need for action. Very soon, the Executive Board of North Yorkshire Police – which I chair – will meet to confirm proposals to address road safety, and we will be taking the views expressed in the survey into full account. Part of our discussions will include increasing the level of enforcement capacity in the police, and I hope to make an announcement on this before the end of July.